The best song Macklemore wrote in the past year didn't make his latest album, didn't make the set list of his tour. The gravity of "Wednesday Morning" — last November's immediate post-election reflection on a world done changed — doesn't fit the sunny, lighthearted vibes of 2017's Gemini, the artist's first solo LP (sans producer Ryan Lewis) in 12 years. Life is mostly good when you're a multiplatinum, Grammy-winning international rap star. Happily married, clean and sober, proud papa… Benjamin Haggerty is in a good place. As the platinum (for Gemini) and diamond (for 2012's breakthrough single, "Thrift Shop") plaques acknowledging Canadian record sales he was presented with at Rebel on Wednesday (November 8) attest, he's no longer a mixtape artist struggling to make it. They say write what you know, so it's fitting that the 34-year-old's newer work is increasingly leaning toward fun, poppy anthems ("Hey look, a Lil Yachty feature!"). Surely he had this fall's 22-date, sold-out tour in mind when creating a collection of songs readymade for the stage. Decked out in an emerald-green Seattle SuperSonics Starter jacket (a Salvation Army find, perhaps? ), Macklemore opened his show with Gemini's triumphant first track, "Ain't Gonna Die Tonight," a song you can imagine making sports arena playlists. "Marmalade" and the rock-tinged "Firebreather" followed, before the energetic headliner dove into the iconic singles that made him a star, "Thrift Shop" and "Same Love." Macklemore took care to change costumes for Gemini's most addictive trifle. Slipping into a purple coat and top hat and swinging a walking cane, he delivered his best Gene Wilder impression for the thumping "Willy Wonka." "Corner Store," another inconsequential but irresistible head-nodder, piled on more glee. The rapper's earnest side peeked through mid-set with "Intentions" and "Otherside," but he made sure to ramp up the packed room's spirits with goofy back-to-back dance anthems. "Can't Hold Us," which made great use of Macklemore's dancing horn section, "Downtown" and "Glorious" tried to out-joy each other as the concert reached a crescendo of delight. 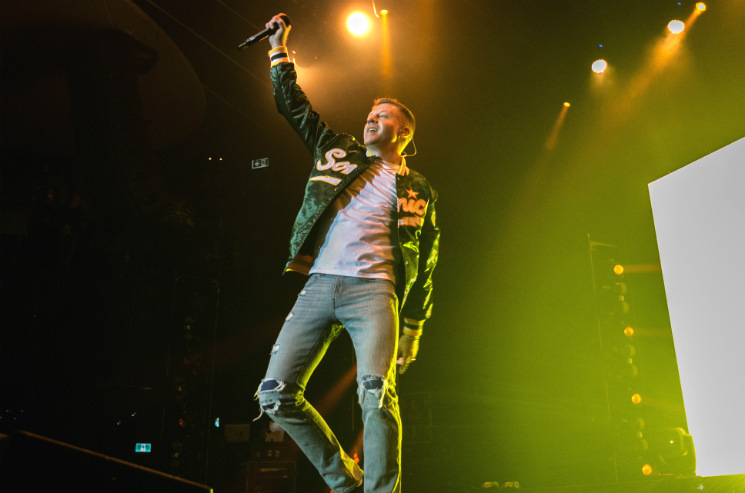 "There's a lot of fear and hatred in the world right now," Macklemore said at one point, when the music stopped. "What people don't understand is that fear and hatred will never be more powerful than love." It's not at all that Haggerty has become deaf to the world's pain; it's more that he understands his music can provide a loud, catchy escape.